Cats are complex creatures with complex needs, that’s why we humans have created elaborate pieces of furniture to satisfy them (but also, let’s be honest, to provide a bit of entertainment for ourselves too). The best cat furniture will give your cat stimulation, while also providing a safe environment for them to interact with. Good, interactive furniture has been proven to improve behavior, mental health, and physical fitness in pets, so it’s important to invest wisely – and save your own chairs from their claws at the same time! In this article, we will look briefly at the benefits of cat furniture, specifically in regards to cat trees. 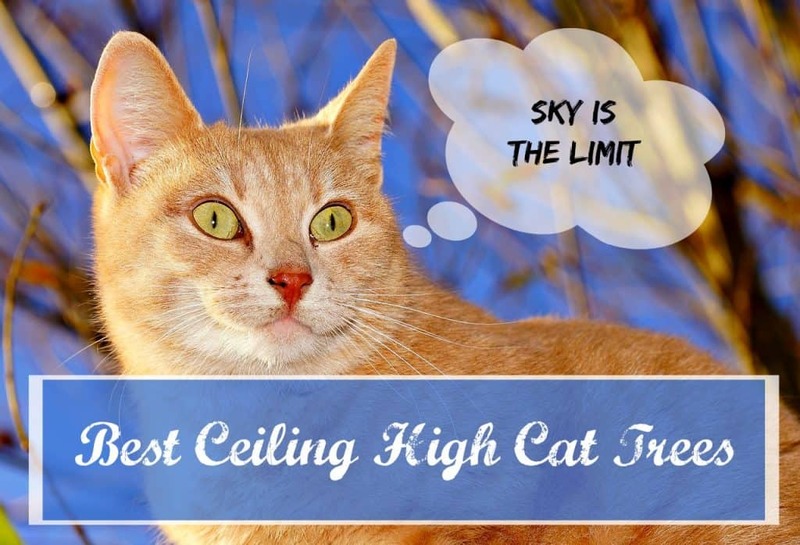 Then we will examine a little further into the realm of ceiling high models, and answering the question, “what are the best ceiling high cat trees around?”, before discussing a few alternatives that you may not have been aware of. 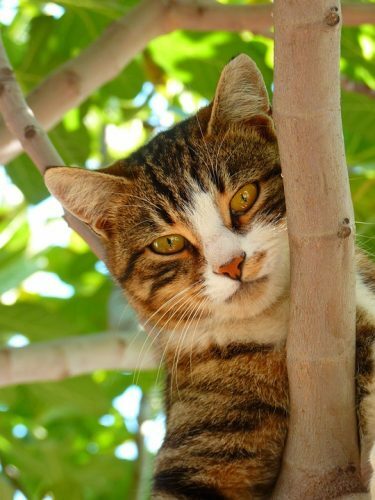 What is a cat tree, and why should you get one? As a dutiful, diligent cat owner, you are more than likely going to want to provide a few entertaining and fun pieces of furniture for your cat to enjoy, whether they spend all day, or only a brief portion of their time indoors. In fact, it’s an incredibly crucial to invest in them; even something as simple as a scratching post can improve both your cats mental health and their physical health – thanks to the act of scratching, stretching, and what it means for their claws and stress levels. Cat trees, being tall pieces of furniture made specifically for your feline friend, typically combine a scratching post with another key idea for cats: their sense of territory. On a cat tree, they get a vantage point and a varied environment that stretches vertically instead of just horizontally. Any animal psychologist will tell you that when it comes to the psychology of a cat, the more territory it ‘owns’, the better and less anxious is will feel. That’s why numerous psychologists espouse that you buy more than one scratching post and place them in different areas of the house. Logically, the extension of a cat tree is either to get more, or to get a far bigger one, such as a ceiling high cat tree. Ceiling high cat trees, which stretch vertically from floor to ceiling, can really expand that sense of territory, or provide an interesting environment for more than one cat (or one really adventurous pet!). Most will be adjustable, but the best ceiling high cat trees will have a way to lock securely in place under tension to prevent the shakes and sways that having a playful cat on it can bring. Next, let’s discuss some of the best ceiling high cat trees available today. Pawhut’s popular model is an adjustable one that can reach up to 116 inches in height. While it may look like a ladder, the climbing is all done via furry, soft-play platforms which hang from the rungs. 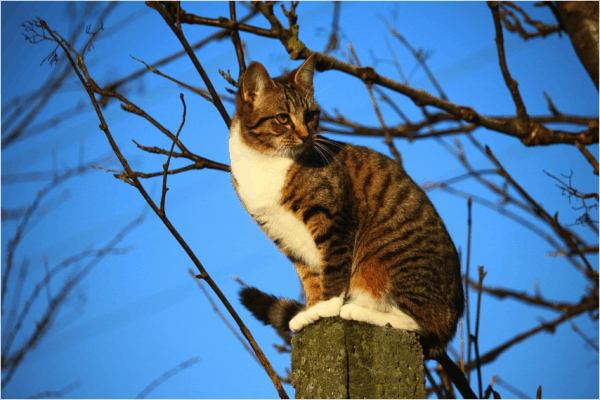 These perches are also moveable, which gives the ability for owners to adjust for the cat’s interest levels, adventurousness, or even their size – so little cats can get high up too. Given the ‘2D’ scale (supported by thin feet rather than a square platform), it can be handily placed against a wall, or behind furniture with little to no obstruction to the rest of the room. Keen reviewers have also stated that they have managed to place it on windowsills or behind curtains, so the cats can remain elevated, sit on the platform (or the furry pouch at the top), and watch the wildlife without obscuring your own view. Given it’s see-through design, it seems that it’s a hit with owners who want to avoid clutter, or even the unsightly image of big, bulky cat furniture. A downside is that it does not contain a place for scratching, nor does it contain any enclosed ‘house’-like parts for hiding. It’s a relaxing place, rather than a playing place. 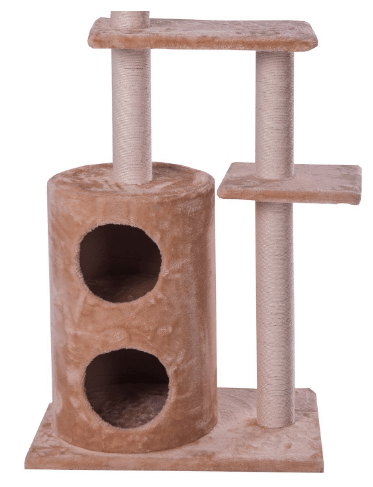 The Merax cat activity tree is a far more conventional style tree, and relies upon the tropes of popular furniture such as the cat condo and the scratching post. Thanks to its large size it, contains a lot more activities than readily available to the Pawhut – including a two-opening ‘house’ at the bottom, and a scratching post top. The latter is covered with sisal, the mainstay scratching post material, while the rest is faux-fur, all of which makes for endless entertainment for even multiple cats. Potential issues include a lack of stability, given the whole thing rests upon one floor platform, and though the pole is adjustable in length, it doesn’t provide the same security without being fixed under tension. As with all cat furniture and toys, it pays to be discerning. Because of their sheer size (when compared to the cat), even the best ceiling high cat tree can often be unwieldy. Large cat trees, if not properly weighted can present a serious hazard for your cat. It can be hard to judge, given you have to take into account the size of your cat. 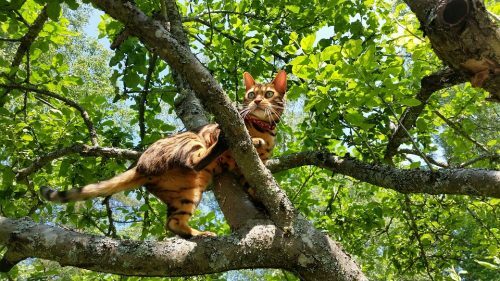 Smaller cats may be unsteady climbers, so a large climbing tree which is unstable and wobbles presents a problem in that it may fall on them. A cheap cat tree, which may save you money, can often be badly constructed and unsuitable. Beyond all of this, they can be too big for many people’s homes. While the cost of getting a cat tree may be mitigated by an attempt at DIY, you should be confident you understand what you are getting yourself into. When building, one want to be sure that you will not come across the same issues as a bought cat tree (bad weight, unstable construction etc.) and you can responsibly create something safe. 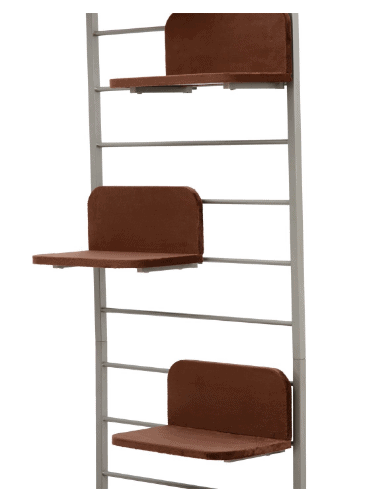 Alternative to ceiling high cat trees include shelves which run along a wall. These can be totally DIY, screwed directly into the walls, and are far sturdier (while also allowing you to dictate the height and steps the cat takes) than a lot of furniture. Just make sure you want them there (and have the permission to have them there) permanently! Perhaps better than one type of furniture is a variety. While large cat trees provide all sorts of activities in one place, there’s no reason those same things (condos, scratching posts, hammocks, platforms etc) can’t be spread out across a larger area. This may give your cat a wider range of territory to roam. A ceiling high cat tree can really provide an amazingly stimulating environment. The best ceiling high cat tree that you choose will depend on your cat’s personality, size, and behavior. A clumsy climber may not get the same benefit as an agile one. An indoor cat might need more consideration and stimulation. You should get one of the height needed. Your own needs come into consideration too, what size house do you have and how do you keep yourself and your cat happy? Is Buying a Cat Tree Really Worth It?